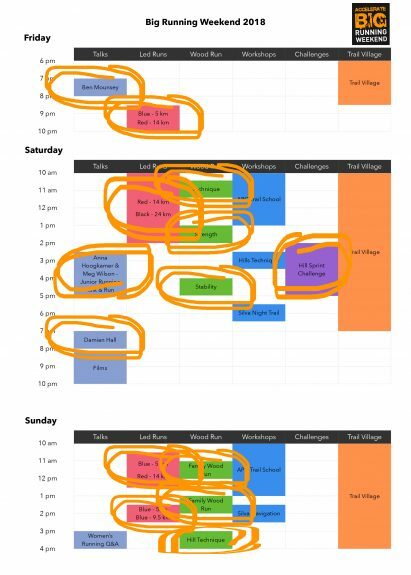 Big Running Weekend promises to be packed with running related activity. So much going on for the bargain price of just £10 (Book here). With so much on offer, it makes sense to prioritise, being sure to attend those activities which might be considered ‘unmissable’. Not one, but two inov-8 supported athletes at the top of their game. Recently completed the Spine Challenger coming 3rd lady in a distance of over 100 miles. Jen, is a vegan runner and happy to answer questions on her running nutrition too. Has coached beginners, through to high performance club athlete’s. Also an ultra runner and last year won the Ladybower 50. Wood Run Leader and GP who is a very experienced runner. Turned her attention to Triathlon and has since competed for GB within her age group. Also has a wealth of experience at Trail and Road Racing. Climber, turned adventure racer turned ultra distance mountain biker and then runner. Has won every UK Adventure Racing title and was consistently in the top 3 for 24hr mountain biking. Turning her attention to Ultra Running she has completed the Ultra Tour du Mont Blanc, taking a top 10 spot in her age category. In Mountain Marathons, such as the OMM she has also been a regular winner or podium finisher. All of these inspiring runners will be sharing exciting tales about their training and racing. Plenty of laughs I’m sure, along with some golden tips for those looking to try similar exploits in future. It’s all about the venue. Ecclesall Wodd is the location of the weekly WoodRun session and is where all of our Leaders started out. Coached sessions that teach the fundamentals of running while exploiting the lush surroundings of this natural beauty spot. They don’t come more runnable. As a bonus, the local authority installed a collection of Run Routes across Sheffield, meaning that from Event HQ we can quickly access two of the very best. The Accelerate Red Route & inov-8 Black Route, each of which reach parts of the Peak National Park, before returning home. Whether you intend to ‘dip your toe’ into off-road running, or have your eye on one of the Outdoor City Run Routes, you’re in safe hands with the Run Leaders from WoodRun & Accelerate Trail Runners. Groups will be led out around courses ranging between 5km & 24km throughout the weekend, at a pace which is suited to those preferring the ‘slow & steady’ approach. Emphasis is on fun and safety. The routes involve the Ecclesall Wood itself, as well as parts of the Peak District (on the longer Red and Black routes). The Leaders know how to control the pace, allowing everyone to enjoy a chat while they run along and take in the sights. To ensure that all are safe, we’ll be insisting that people are realistic about their ability to take on the distance and conditions on the day, but also have with them a basic list of essentials*, listed at the bottom of this blog. I will – myself, be leading you around the Blue Loops within the Ecclesall Wood, for upto 9.5km worth of oustanding wooded trail. Running Powerhouse Saucony are a brand who know their onions. When it comes to speed, they have footwear for the job. So with the option of testing their shoes, you can attempt the Hill Sprint Challenge. A steep path on the side of the hill within Ecclesall Wood, only a short walk/jog from Event HQ. Once there, you’ll be given three attempts to summit the hill (section) in the least amount of time you can. Then your best time will be recorded on the Leaderboard so that people can see where they rank (just for fun). What’s more – everybody who has a go will be entered into a prize draw for a chance to WIN a pair of Saucony running shoes. There will be a Men’s and a Ladies’ pair awarded to the first Male & Female drawn from the entries upon close of the event. Well worth sticking around for. The showcase for all that is WoodRun. Sessions specifically designed to deliver useful and fun techniques to runners of all abilites and experience. 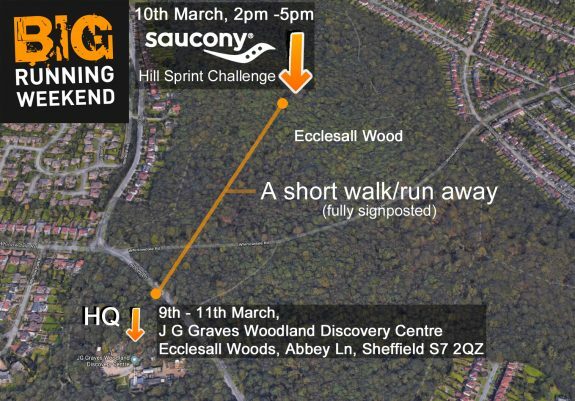 Drills and exercises for runners to practice, so that they can become stronger, more efficient and less prone to injury – all of which is put into action while running around the splendid Ecclesall Wood, with post session refreshments provided by the Woodland Coffee Stop. For anyone tempted to visit one or more of these sessions, there will be a particular theme for each one and a specific benefit for the individuals taking part. Regardless, everyone will have a good time and discover just how much fun it can be getting ‘strong to run’, rather than ‘running to get strong’. Often overlooked, but definitely as important as anything else on offer during the weekend. The young runners get the focus they deserve during this 2.5hr session on Saturday afternoon. Team Accelerate’s Anna Hoogkamer (inov-8) and Megan Wilson (Scott) deliver a coached session with plenty of information being shared, about their transition from the Junior circuit into full blown Adult Racing. With a RunTalk of their own, some Q&A and practical work being demonstrated by these highly accomplished young athletes, for any aspiring young runners, this session should be top priority. So there you have it. If you can’t make it to the entire weekend, then these are my suggestions for a ‘Top Five’, but feel free to choose the sessions which for you, hold the greatest appeal and don’t forget your spending money for that hard earned cake! Waterproof outer layer with taped seams. (including long tights or over-trousers if conditions threaten to remain cold/wet/windy). Spare warm long sleeved top. Personal snacks & drink enough for upto 3 hours, on the move in open country. Suitable footwear with grip on wet or lose surfaces, such as deep studded trail shoes or fell shoes (don’t forget that our sponsors will be supplying test footwear if you’d like to use then during the Led Runs, subject to availability). Leaders will have with them Blankets, Survival bags and Map/Compass on behalf of the group. Don’t forget your sense of humour! Running. Films. Films about running. It's all good.